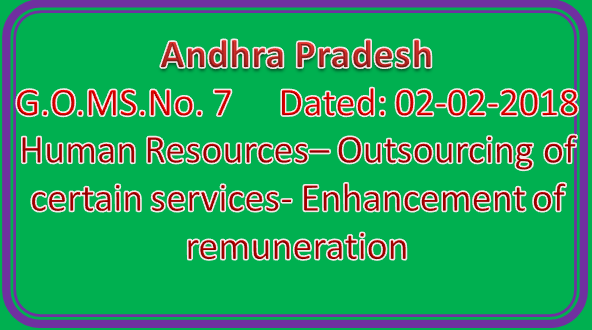 Human Resources– Outsourcing of certain services- Enhancement of remuneration– Orders – Issued. 1. G.O.Rt.No.3080 G.A (Cabinet) Department, dated 09.09.2014. i.e., (1)Rs.6700-20110 to 7960-23650 (2) 7960-23650 to 10200-29200 and (3) 10900-31550 to 13660- 38570. The remuneration was enhanced to the outsourcing employees in the above three pay ranges at (1) Rs.12,000/- P.M (2) Rs.15000/- P.M and (3) Rs.17500/- P.M respectively including the posts of DEO and DPO. Certain categories of outsourcing employees who have been working in the posts that have superior pay scales to 13660-38570 have remained outside the purview of the above orders and drawing the existing remuneration as was fixed earlier. 2. The Group of Ministers constituted vide the reference first read above on reviewing the existing system of contractual employment has decided to allow the enhancement at 50% of the existing remuneration to the categories of outsourced functionaries who were not covered and remained outside the purview of enhancement of remuneration orders issued in the reference second read above. 3. Accordingly, the Government hereby issue orders for enhancement of the remuneration at 50% of existing remuneration subject to not exceeding the minimum of the wage in the time scale of relevant equal category of post in RPS 2015 whichever is less, in respect of outsourcing employees who are not covered in enhancement orders issued in the reference second read above with immediate effect, subject to following the comprehensive guidelines on outsourcing functionaries issued in the reference second read above. 4. The enhancement of remuneration ordered in para (3) above is applicable only to those outsourcing functionaries who are appointed with the prior permission of Finance Department.